Challenge 5. How can decisionmaking be enhanced by integrating improved global foresight during unprecedented accelerating change? Although the most significant of the world’s challenges and solutions are global in nature, global foresight and global-scale decisionmaking systems are rarely employed. Global governance systems are not keeping up with growing global interdependence. Since governments and large corporations have to make decisions taking into account global changes that are beyond their control, many are creating future strategy or foresight units to contribute to their strategic planning. Finland created a permanent Parliamentary Committee on the Future in 1993 to support government foresight and decisionmaking. Decisionmakers are rarely trained in foresight and decisionmaking, even though decision support and foresight systems are constantly being improved with artificial intelligence, big data analytics, simulations, collective intelligence systems, e-governance participatory systems, and a deeper understanding of psychological factors that impinge on decisionmaking and its outcomesand as mobile apps proliferate. Futures research is the systematic exploration of assumptions about future possibilities; unfortunately, its work has not been systematically evaluated and applied to improve its quality and to demonstrate its effect on decisionmaking. Instead, the tyranny of the moment tends to overrule long-term global perspectives. Short-term, selfish, economic decisionmaking can be blamed for the 2008 global financial crisis, continued environmental degradation, and widening income disparities. The long-term goal to land on the moon accelerated technological innovations and economic growth and lifted the human spirit. The long-term goal to eradicate smallpox inspired many people to cooperate across cultural and political divides. A U.S.-China long-term goal on climate change could inspire even greater international collaborations. Humanity needs a global, multifaceted, general long-term view of the future with long-range goals to facilitate contemporary decisions that lead to a brighter future, and this requires a means for linking research agendas and R&D to those goals. The UN Sustainable Development Goals for 2030 provide much of that framework, but we still need to understand the potential consequences and opportunities afforded by accelerating future technological innovations. In the meantime, national foresight and decisionmaking can be improved. See Daniel Kahneman, Thinking, Fast and Slow, Farrar, Straus and Giroux. Establish a permanent parliamentary “Committee for the Future,” as Finland has done, to provide foresight for government and other parliamentary committees. Establish or improve future strategy units for heads of state and government. Link these government units with corporate, UN, and academic future strategy units to improve international strategic coherence and coordination. Create a network of government and nongovernmental futurists on call for quick futures assessments (Real-Time Delphi software could support this). Compute and publish annual national and global State of the Future Indexes. Develop national online collective intelligence systems on the future of the nation, with public access. Create a classified collective intelligence system for the heads of government connected to related units in government to offer the opportunity of some continuity in national long-term strategy from one administration to the next. Synthesize relevant futures research for an annual State of the Future report for nations, issues, sectors, and/or organizations. Include 5–10 year allocations in government budgets based on rolling 5–10 year SOFIs, scenarios, and strategies. Advisors to decisionmakers should participate in the informal long-term strategy networks to share and learn best practices. Require a “future considerations” section in policy reporting requirements. Create institutions that teach decision-making; the curriculum could include foresight, risk, uncertainty, psychology, game theory, successful historical decision situations, and potential future crises. Add foresight as a performance evaluation criteria for senior government officials. Include how to connect foresight to decisionmaking in government training programs. Test proposed policies before implementation by postulating random future events of all sorts and evaluating how these might affect the policies. Teach decisionmaking, foresight, futures research, and synthesis as well as analysis throughout educational systems. Fund convergence among disciplines to address global challenges. Create stronger links between R&D budgets and priority of problems that need solving. See prototype at http://www.changesignals.com (code: whatif)). Government and corporate future strategy units are proliferating (see Government Future Strategy Units in GFIS), but they have yet to sufficiently influence decisions on the scale and speed necessarily to address the complex integrated and global nature of accelerating change. Intergovernmental organizations and public-private collaborations are also increasing, but they too have to become far more effective. Because UN Member Nations have agreed to collect data on 171 indicators of the UN Sustainable Development Goals, a global change bigdata analystics will be avaiable to all to support decisionmaking. Decisonmakers are rarely trained in foresight and decisionmaking, even though decision support and foresight systems are constantly improving—e.g., Big Data analytics, simulations, collective intelligence systems, indexes, and e-governance participatory systems. Decisionmakers and their advisers should be trained in futures research for optimal use of these systems (see GFIS for a 39-chapter collection of Futures Research Methodologies). Government leaders would be well advised not just to request foresight reports and briefings from futurists but also to periodically discuss long-range issues with leading futurists. For example, the futurist Herman Kahn had about 20 discussions with the President of South Korea over a 10-year period that led to Korea’s economic miracle. This was an excellent example of how decisionmaking can be improved by global foresight. Decisionmaking and foresight should be taught throughout education systems, fostering an awareness that the acceleration of change reduces the time from the recognition of the need to make a decision to the implementation of that decision. Universities should fund the convergence of disciplines, teach futures research and synthesis as well as analysis, establish decisionmaking curricula, and produce generalists in addition to specialists. Futures methodologies can be converted to teaching techniques so that people learn a subject and its future potentials. Since decisions are based on beliefs about the future, collecting and responding to diverse feedback about these beliefs should improve decisionmaking. However, judging information about the future is increasingly difficult due to the acceleration, complexity, interdependency, and globalization of change. In addition, the growing number of people and cultures involved in decisions also increases uncertainty and ambiguity about the future. The proliferation of choices seems to be growing beyond our abilities to analyze, synthesize, and make good decisions. We are so flooded with irrelevant info-noise that it is difficult to know what is truly significant. As a result, individuals and institutions rely more and more on computer systems. Just as the autonomic nervous system runs most of our biological decisionmaking, so too will artificial intelligence connected to sensor systems, Big Data, and the Internet of Things increasingly make day-to-day decisions for the management of civilization. Augmenting these will be institutional and individual collective intelligence (emergent properties from synergies among brains, software, and information) systems for “just-in-time” knowledge to inform decisions. At first, ubiquitous computing or the Internet of Things is likely to increase the number of decisions we make per day, constantly changing schedules and priorities, but then as AI apps proliferate, much of this decisionmaking burden should be reduced. Decisionmaking will be increasingly augmented by the integration of sensors embedded in products, in buildings, and in living bodies—all connected with a more intelligent Web. Future synergies among the human brain projects of the U.S., EC, and China—along with Google’s evolving intelligent personal assistants and future versions of IBM’s Watson and AI systems—should make us augmented genius decionmakers compared with today. In the meantime, institutional and personal collective intelligence systems will help us select and integrate experts, information, and decision support software to receive and respond to feedback for improving decisions. The United Nations’ Global Pulse is connecting UN data and development projects addressing the UN Development Goals with software tools to improve decisionmaking. During 2016 it prototyped seven big data innovations for humanitarian action with UNHCR, UNICEF and WFP and worked with governments and NGOs to better use UN data. UN Pulse is credited with forecasting food security and migration and disease patterns, along with identifying lead indicators of crime, improving disaster management, and tracking global development in real time. Yet options to create and update national, global, corporate, and individual foresight are so complex and changing so rapidly that it is almost impossible for decisionmakers to gather and understand the information required to make and implement coherent policy. At the same time, the consequences of incoherent policies are so serious today that new systems are urgently needed. One approach is to create collective intelligence systems that can better integrate ongoing feedback among people, information, and software to produce insights beyond the addition of its parts. This can help secure agreement to make necessary changes. CISs can be created for issues, countries, companies, universities, individuals, and the world (such as the Global Futures Intelligence System) and can be connected with other elements of our emerging global brain and planetary nervous system. CISs can facilitate the establishment of resilience systems—the capacities to anticipate, respond, and recover from disasters while identifying future technological and social innovations and opportunities. Better global, national, and local training and the use of websites for real-time updating via mobile phones to improve situational awareness are needed to improve resilience from massive potential future disasters. Implementing and integrating resilience and collective intelligence systems is one way to improve decisionmaking, given the global and local acceleration of change. Humanity needs a global, multifaceted, general long-term view of the future with long-range goals to facilitate contemporary decisions that lead to a brighter future. (See GFIS International Assessment of Global Goals for 2050.) Such views and goals should be informed by global and local futures research. Futures research is the systematic exploration of assumptions about the future; unfortunately, its work has not been systematically evaluated and applied to improve its quality and to demonstrate its effect on decisionmaking. Instead, the tyranny of the moment tends to overrule long-term global perspectives. Short-term, selfish, economic decisionmaking can be blamed for the 2008 global financial crisis, continued environmental degradation, and widening income disparities. The long-term goal to land on the moon accelerated technological innovations and economic growth and lifted the human spirit. The long-term goal to eradicate smallpox inspired many people to cooperate across cultural and political divides. A U.S.-China long-term goal on climate change could inspire even greater international collaborations. Some of these ideas are further discussed in Anticipatory Governance, a report about how to integrate foresight in the U.S. White House and other executive branches of government; much of its advice is relevant to all governments. Since our long-range challenges are global in nature, they require global strategies and systems to be successfully addressed. The United Nations has the UN Strategic Planning Network, which connects UN agency strategy units. Singapore initiated an informal network of national government future strategy units. Intelligence agencies had the Global Futures Forum. The World Economic Forum connects government and business foresight. If these and other such global systems created common platforms, foresight and decisionmaking could be improved. The Global Futures Intelligence System (themp.org) is a beginning in that direction. Futurists also should create more useful communications with policymakers. Alternative scenarios should be shared with politicians and the public for feedback. They should show plausible cause-and-effect links between a future condition and the current realities. Scenarios should illustrate decision points where different strategies and policies can lead to different consequences. Decisionmakers and staffs can explore many alterative futures and their potential consequences quickly using alterative adaptive learning models such as cellular automata, rules- or agent-based models, genetic algorithms, and neural networks. Their capability and accuracy are growing rapidly, and databases describing individual behavior are becoming even more massive. Analysis of such big databases may lead to the equivalent of social science laws that can, when fully developed, be used to forecast group behavior. Using leading indicators instead of lagging indicators can make analytics more useful to anticipate the need for decisions rather than reacting to surprises. Because the speed of change is accelerating, an organization’s strategic consciousness is becoming more important than static strategic plans. This allows for management by understanding instead of just setting fixed objectives. It also can help an organization act more like a complex anticipatory adaptive system and, where appropriate, reinforce the principle of subsidiarity—decisions made by the smallest number of people possible who are closest to the execution and impact of a decision. Increasing numbers of arts, media, and entertainment professionals are bringing global long-term perspectives to the public. Communications and advertising companies could create memes to reinforce foresight. For example, From Reaction to Anticipation or simply Think Ahead. Previous popular examples of memes include Think Globally, Act Locally and Small is Beautiful. These slogans spread quickly among thought leaders of the world. Such memes can help the public become more sensitive to long-term perspectives so that more future-oriented educated publics could elect more future-oriented, globally minded leaders. Prizes could also be given to recognize the best examples of global long-term decisionmaking. 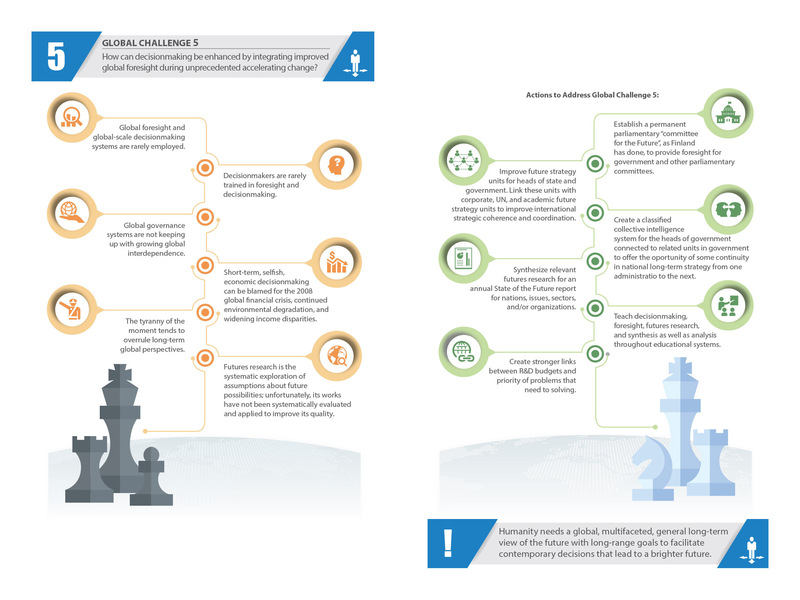 Each of the 15 Global Challenges and the next set of UN Sustainable Development Goals could be the basis for a TransInstitution (a coalition of self-selected governments, corporations, NGOs, universities, and international organizations) that is willing to commit the resources and talent to address a specific challenge or goal. ·National corporate law is modified to recognize TransInstitutional organizations. Sub-Saharan Africa: UN’s Global Pulse is applying Big Data to improve African development dicsionmaking. Foresightfordevelopment.org makes research documents, projects, scenarios, futurists, and blogs available to support African futures research. China has become a force in African long-range planning; it will be the second largest export destination for Africa. Daily management of many African countries makes future global perspectives difficult; hence, more-regional bodies like the African Union, UN Economic Commission for Africa, and the African Development Bank are more likely to further futures work in Africa and should build on 10 years of work of UNDP/African Futures. Civil society is also becoming a bigger factor in foresight, although it may need external pressure for freedom of the press, accountability, and transparency of government. Corporations are also helping. For example, Microsoft is implementing e-government systems to improve transparency and decisionmaking. If the brain drain cannot be reversed, African diaspora should be connected to the development processes back home through Internet tele-nation systems. Much of Africa continues to struggle with keeping the cultural advantages of extended families, while making political and economic decisions more objective. Middle East and North Africa: The Egyptian Arabic Futures Research and Studies Association is connecting futurists and think tanks in the region to share insights.The Arab Spring/Renaissance/Revolutions are yet to open the decisionmaking processes, increasing freedom of the press to better inform the public. Israel is planning a strategic program to anticipate science/technology revolutions. Europe: The International Conference on Future-Oriented Technology Analysis is a major annual gathering of the European futurists who share best practices. The Euro crisis has kept Europe’s focus on itself, not its long-term role in the world; however, the recent EU elections and EC reorganization has initiate long-term assessments. Other factors making Europeans review global long-term perspectives include changing ethnic demographics, forecasts of Asian and African migrations, the emergence of China, and public finances for social and health services for an aging population. Tensions between the EU and its member governments and among ethnic groups are making decisionmaking difficult. The EU2020 strategy for a sustainable social market economy builds on the Lisbon strategy for growth and jobs. The EU Committee of the Regions and the European Observation Network for Territorial Development and Cohesion supports foresight studies. The European Parliamentary Technology Assessment is a network and database of 18 European parliaments integrating futures into decisionmaking. The 7th Framework Programme of the EU expands foresight support; the Institute for Prospective Technological Studies provides futures studies for EU decisionmaking; the European Foresight Platform connects futurists; iKnow Project scans for weak signals and wild cards; and the merger of the European Regional Foresight College with Millennium Project European Nodes has created Foresight Europe to improve European futures research and instruction. The Netherlands constitution requires a 50-year horizon for land use planning. Russian Ministries use Delphi and scenarios for foresight, while corporations tend to use technology roadmaps. Poland 2050 encourages more qualitative than quantitative approaches for long-term analyses. State of the Future Indexes have been created for the first time in Poland, Hungary, Slovakia, and updated in the Czech Republic. Europe is experiencing “reporting fatigue” due to so many treaties and bureaucratic rules. Russia is improving policy decisionmaking efficiency by coordination among stakeholders in nanotechnology research among several Councils, Commissions at the Russian Parliament, the government, and the Russian Academy of Science. “Open Government” was established in 2012 to improve interaction between the public and govenment by providing public data on government spending, procurement, and investment. Latin America: The Inter-American Dialogue has documented the growing interest in futures research in the region (See Why and How Latin America Should Think About the Future ) such as Brazil 2022, Visión Nacional 2030 (Mexico), México 2042, Chile 2025, Surfeando Hacia el Futuro: Chile en el Horizonte 2025, Latinoamérica 2030 (The Millennnium Project Latin American Nodes), América Latina 2040 (CAF), Plan Perú 2021, Visión Colombia 2019, Estrategia Nacional 2010/2025 (Ecuador), Estrategia Nacional de Desarrollo 2030 (Dominican Republic), Un Viaje de Transformación Hacia un País Mejor, 2030 (Dominican Republic) and Estrategia Nacional de Desarrollo 2030 (Dominican Republic). The Millennium Project’s Latin Ameriocan Nodes and others have formed RIBER (Red IBERoamericana de Prospectiva). Venezuela has the Sembrar el Futuro prize for students’ futures thinking, and Mexico initiated the Global Millennium Prize for students’ ideas for addressing global challenges. Since the average age in Latin America is only 24, it is fundamental to incorporate the visions of the next generation via social networks and apps. To reduce political conflicts, the Mexican government got political parties to agree to the “Mexican Pact” on basic long-term reforms prior to submitting legislation. Chile is pioneering e-government systems that can be models for other countries in the region. For e-government to increase transparency, reduce corruption, and improve decisions, Internet access beyond the wealthiest 20% is necessary. The remaining 80% suffer from inefficient service, difficult access locations, restricted operating hours, and nontransparent processes. Latin America has to improve citizen participation and public education for political awareness. North America: The “Anticipatory Governance” report explains how to create a foresight capacity in the White House: Create a map of individuals and organizations with foresight and use it to create a virtual organization at the White House (USA) and Langevin Block (Canada) for regular input to the policy process. “Future considerations” should be added to standard reporting requirements. Examples of successful global long-range activities should be promoted (see Factors Required for Successful Implementation of Futures Research in Decisionmaking) along with cases where the lack of futures thinking proved costly. Global perspectives in decisionmaking are emerging due to perpetual collaboration among different institutions and nations that has become the norm in addressing the increasing complexity and speed of global change. Global long-term perspectives continue to be evident in the climate change policies of many local governments. In 1997 IBM’s Deep Blue beat the world chess champion; in 2011 IBM’s Watson beat top TV quiz show knowledge champions. What’s next? Apps on mobile phones for collective intelligence? Blogs and self-organizing groups on the Internet are becoming de facto decisionmakers in North America, with decisions made at the lowest level appropriate to the problem. Approximately 20% of U.S. corporations use decision support systems to select criteria, rate options, or show how issues have alternative business positions and how each is supported or refuted by research. Intellipedia provides open source intelligence to improve decisionmaking. The region’s dependence on computer-augmented decisionmaking—from e-government to tele-business—creates new vulnerabilities to manipulation by organized crime, corruption, and cyberterrorism, as discussed in Challenges 6 and 12.